If some program isn't working correctly on your Windows-8/8.1 version, try running in Win-8/10 compatibility mode. Do this! Open the properties of the corresponding program through a right click of the mouse on the not correct working Program, and then click "Properties" (... see Image 1 Arrow-1) then the Tab "Compatibility" (... see Image 1 Arrow-2) . In the "Compatibility Mode" group box select the check mark [X] (... see Image 1 Arrow-3) to run the program in compatibility mode (... see Image 1 Arrow-4). And in the selection field (... see Image 1 Arrow-5) select the appropriate operating system. Do not forget to click the "Apply" button (... see Image 1 Arrow-6). See also: ... Open the Windows 8 program path via Task Manager. /&/ ... Find and open the Program Files folder. Windows-8 run the not working programs in compatibility mode! Runs the program in a smaller-sized window. Try this setting if the graphics for the program appear jagged or are rendered improperly. Turns off automatic resizing of programs if large-scale font size is used. Try this setting if large-scale fonts are interfering with the appearance of the program. Runs the program as an administrator. Some programs require administrator privileges to run properly. If you aren't signed in to your PC as an administrator, this option is unavailable. You can also open the Program Compatibility Troubleshooter by pressing and holding or right-clicking a program's icon or shortcut on your desktop, and then tapping or clicking Troubleshoot compatibility. Windows-8 - FAQ-98: Start the programs in compatibility mode on Windows 8.1 / 10, how to? How to open a program in compatibility mode? Run a program in compatibility mode windows 8.1 or Win 10? How to run older aplication on window 8.1 with pictures? Compatibility mode windows 8 and Win 8.1 or Win 10? Windows 8 switch to compatable mode 98? Why does a program try to open from the start pane in windows 8.1? Turn off progrsm compsbility in windows 8.1 or Win 10? Windows 8.1 compatability with Win XP programs? What compatibility mode does windows 8.1 supports? Run program on start win8? How to run windows 98 programs on windows 8.1 or Win 10? How to turn off windows program compatibility mode windows 8? Changing from capatibility mode to normal mode? Windows 8.1 how do you get compatibility mode? How to window 8.1 compatiblity mode to normal? How to turn off windows compatibility mode windows 8? How to make windows compatible 8.1 or Win 10? Will windows 98 programs run on windows 8.1 or Win 10? Programs no compatability mode on windows 8.1? How to get into normal mode in windows 8 from compatibility mode? How to open compatibility settings in windows 8? How to run windows 8 mode on windows 8.1 or Win 10? How do i change compatability mode to normal mode? How to open programs in windows 8.1 or Win 10? Windows 8.1 set Texmod in windows XP compatibility mode? Run Programs in Compatibility Mode in windows server 2012? How can i turn off windows program compatibility win8? Windows Server 2012 run in compatibility mode? How to turn off windows program compatibility mode in windows 8? I have windows 8. 1, How do I change the compatibility mode so that I work in windows 8? Win 8 98 compability mode? Program properties in win 8 run in compatibility mode? Turn off windows program compatibility mode windows 8.1 or Win 10? Compatability mode in win 8.1 for older programmes? 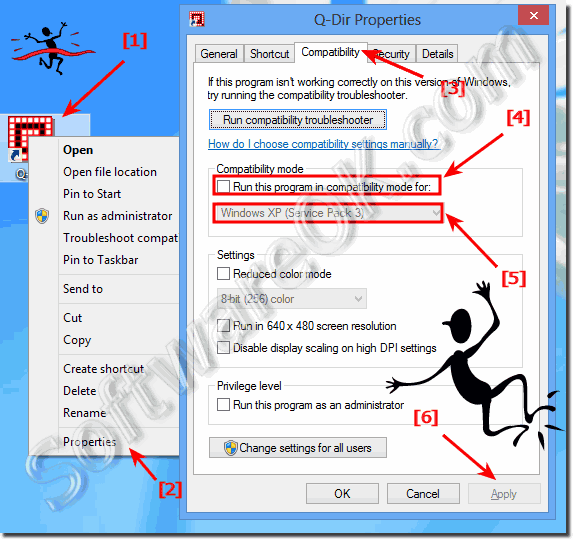 Turn off compatibility mode in windows 8.1? How to do compatibility mode on windows 8.1? Run this program in compatibility mode for windows 8.1? No program execute in window 8.1 or Win 10? Okay to transfer ms word 10 from win 7 to win 8.1? Windows 8.1 how turn program impatibility mode? How to turn off program compatibility windows 8? How to turn off windows program compatibility? How change compitability mode to normal mode using window 8.1? How to restart Windows 8 programs from compatibility mode to normal mode? Server 2012 turn off program compatibility mode? How to disable change from compitability mode to normal mode using window 8.1 or Win 10? How to change. compatible mode from Windows 8.1 to Windows Xp? How to change from compatibility to normal mode windows 8.1 or Win 10? Windows program compatibility mode is on turn it off? How to run windows 98 compatibility mode in 8?